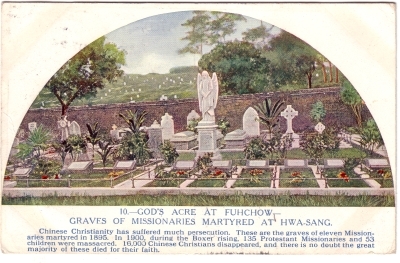 Caption: God’s Acre at Fuhchow--Graves of MIssionaries Martyred at Hwa-Sang. Chinese Christianity has sufferd much persecution. These are the graves of eleven Missionaries martyred in 1895. 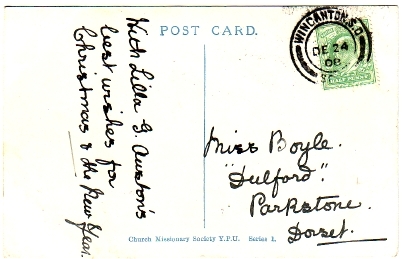 In 1900, during the Boxer rising, 135 Protestant Missionaries and 53 children were massacred. 16,000 Chinese Christians disappeared, and there is no doubt the great majority of these died for their faith. Action: Western cemetery with a line of simple tombs in the front. More elaborate monuments are also seen. Chinese tombstones are scattered beyond the wall enclosure. Image Particulars: Propaganda image of a cemetery, presented in connection with massacres of missionaries and their families.